Happy Halloween! Halloween is a favorite holiday among many children. Dressing up as your favorite character, receiving enormous amounts of candy, and staying up past bedtime with friends and family are some of the fun activities children look forward to on Halloween! For children with Autism or Sensory Processing Disorders, Halloween is usually associated with loud noises, scary decorations, spooky fog machines, and interactions with complete strangers. Children may feel overwhelmed and frighten by costumes and decorations. Before stepping out to begin your trick-or-treating adventures tonight, prepare your child and plan ahead! When picking out a costume, keep in mind your child’s comfort level. Try to find an outfit that allows for them to keep their normal clothes on, but also adding in a fun prop. This way they feel comfortable with what they are wearing while also participating in the festivities. For example, adding a pair of wings can make a fairy costume, a cowboy hat and boots transforms a normal outfit into a cowboy, and a police cap and badge converts a child into a cop! However, don’t force your child to wear a costume, no matter how cute it may be. In fact, instead of making your child wear a costume, let them pick out a silly hat or simply just wear a Halloween shirt. Avoiding neighborhoods with sensory trigger decorations is necessary for helping your child feel comfortable. Drive around your neighborhood in advance to scope out houses with minimum or friendly Halloween decorations. Choose familiar houses that your child might recognize or know the owners of. Discuss with your partner, as well as your child, which houses to go to, how many go to, and in what order before going trick-or-treating. Set realistic goals for your child. For instance, plan for three houses. If your child is having fun, add more to the list. If they hate it, be flexible and call it a night early. Plan a visual schedule for the trick-or-treating path. Visual schedules are typically a sequence of pictures that explain a schedule. 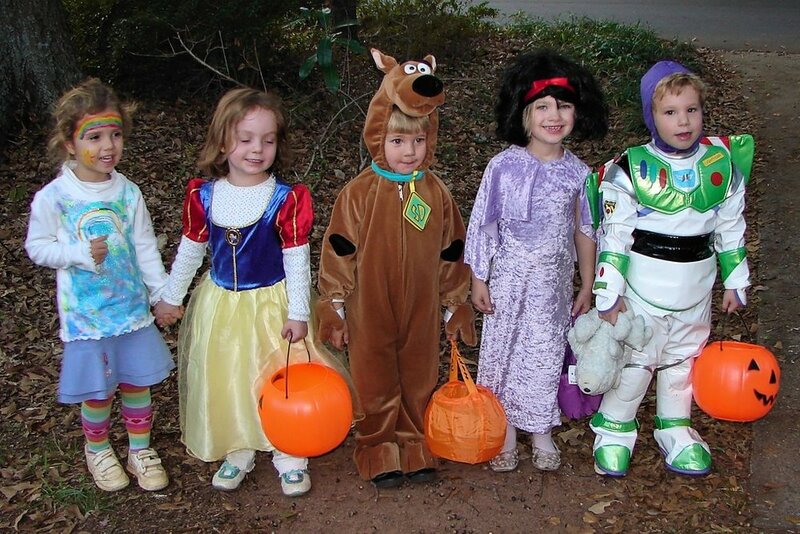 In this scenario, the pictures would represent the timeline and activities associated with trick-or-treating. For example, providing pictures for putting on a costume, walking to the first house, saying “trick-or-treat”, taking candy, putting candy in a bag, and saying thank you are great visuals. Familiarize your child to the schedule before trick-or-treating and refer to it as you participate. Some children may not be ready for trick-or-treating this year, which is normal! Create a mini trick-or-treating experience in your own house. Invite family and friends over and designate each room as a “stop” for trick-or-treating. Another alternative to trick-or-treating is to stay at home and hand out candy. Before the trick-or-treaters arrive, practice using greeting phrases and handing out the candy to each person. Since many children have allergies or restricted diets, candy may be a big concern for parents. Create a trade system for the candy. Have your child turn in a certain amount of candy for a day spent doing their favorite activity. A monetary token system can also be applied. Each candy can equal 20 cents, or whatever value you decide. Your child can learn the value of earning and saving money to purchase a new toy. Make realistic expectations for the night and be prepared if things don’t go as planned. Weather is always a concern for trick-or-treaters as well. Prepare your child for changes in the weather. Explain that there is always a possibility trick-or-treating may be canceled if the weather is severe. Feel free to make new traditions for you and your child with Autism. Prepare your child for the day, and remember to have FUN! Happy trick-or-treating! "Halloween Tips for Kids with Autism." Autism Speaks. Autism Speaks INC, n.d. Web. 19 Oct. 2016. Sciortino, Bethany. "Halloween for Children with Autism." Autism Support Network. Autism Support Network, n.d. Web. 19 Oct. 2016. "Trick-or-Treating That's Fun for Kids with Autism and Sensory Processing Disorders." Easterseals. N.p., n.d. Web. 19 Oct. 2016.